Purchase, “A Widow’s Pursuit”, here. When Cindy suddenly became a 34 year old widow, with two young children, she was thrown into shock. Due to her Christian upbringing, she immediately found peace by clinging to her faith. Once reality surfaced, she was overwhelmed with responsibilities and unfamiliar feelings. She had to figure out a way not to feel the pain. She overindulged in unhealthy and risky behaviors. Due to her negligence, a terrible accident happened to her daughter. Embarrassed of how out of control she had been, she realized she needed God’s help. By no longer dodging her grief, she’d cry every night and trusted God to take away her pain and heal her broken heart. She found herself moving forward and finding comforting moments. Then there were days she’d collapse in despair. Old memories could trigger panic attacks. Childhood memories revealed that her deceased husband was only part of her past. She then reached a point where she accepted her loss. Being a single mom brought about a lot of confusion with new relationships. She struggled with males over being just friends, going on dates, as well as getting in vulnerable situations. Going through grief wasn’t easy, but Cindy realized that as long as she pursued God’s will for her life, she would reap more peace and comfort. Once through her grief, she understood the meaning of her journey. She became more compassionate to others that had experienced losses. She was able to make new goals as she went back to school and obtained a LMSW degree in social work. A WIDOW’S PURSUIT: Finding Out There’s More to Life Than Grief, is not only written from Cindy’s grief years, but beyond. Grief had become only a small part of her life. This book is a complete journey through Cindy’s grief and finding an amazing life after her loss. Not only is Cindy Adam’s one of my best friends, but she is an inspirational mentor in my life. Cindy’s journey through grief is a true testament of the faith and love that she has in her heavenly Father. Cindy has helped me in my life’s journey more times than she’ll ever know! 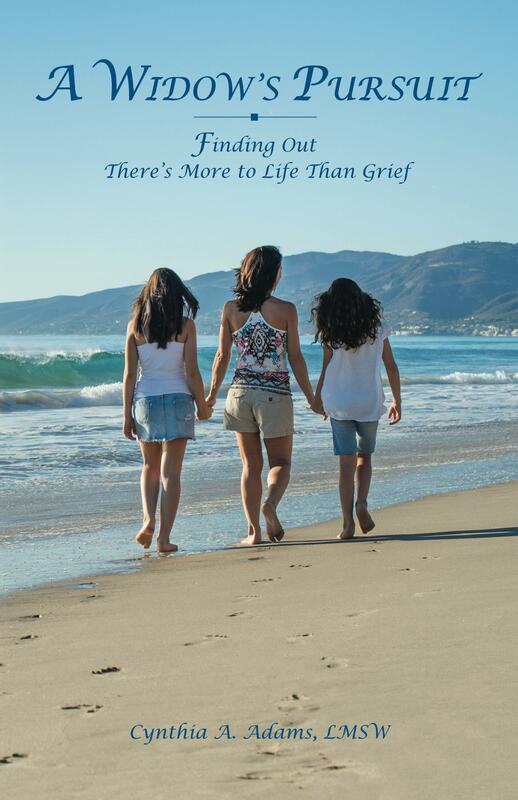 I highly recommend that you read Cindy Adam’s book: A Widow’s Pursuit: Finding Out There’s More To Life Than Grief. I really felt as though I were going along with Cindy and her family during the experience. She expressed all the emotion as the reality set in, and didn’t spare any details regarding her grief process- which is one of the reasons I think this book will be such a help to people going through losses. The honesty comes through, as does her walk towards recovering and dealing with what her life had been handed. It is an excellent example of encouragement and healing, and inspiration to those who need to find their own peace. An amazing mother, best friend and writer! Not only do I want to share with you that Cindy is a remarkable writer, but she has taught me about life and how you never know what tomorrow will bring you. She is a mentor and friend to me and I couldn’t have asked for a more amazing mother! I thank God every night for the life I have. I give it all to him and thank him for blessing me with such a kind, compassionate mother.